From a Washington Post story by Sarah Pulliam Bailey: "Fact checking ‘The Crown’: Queen Elizabeth’s close relationship with preacher Billy Graham." I watched most of the first season of that series but haven't kept up with this one. This season has been criticized for more historical inaccuracies than the first. The Post story is an effort to get it right. .... Scholars believe the queen possessed a “deep vibrancy of her faith” as someone who read scripture daily, attended church weekly and regularly prayed, said Stan Rosenberg, a member of the Faculty of Theology and Religion at the University of Oxford. Despite suffering some public attacks for her handling of Princess Diana’s death and her political views, she is widely admired for her faith, and “folks here know her to be thoughtful, authentic, serious, and devout but not a pressingly intrusive Christian,” he said. The queen’s Christmas messages, a British tradition that goes back to 1932, have provided a window into her private faith. 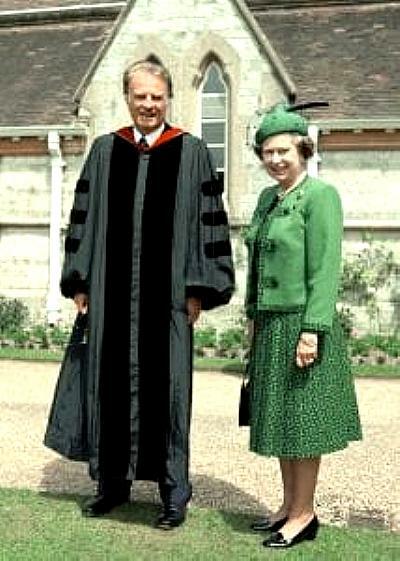 The queen’s meeting with the evangelist came about after Graham launched one of his evangelistic “crusades.” Graham had spoken to “the greatest religious congregation, 120,000, ever seen until then in the British Isles,” according to a biography of the late John Stott, a chaplain to the queen. During one of his rallies, Graham preached for 12 weeks, drawing 2 million. Graham delivered a sermon for the queen on Easter Sunday in 1995 in the royal family’s private chapel. ...Queen Elizabeth has made several public comments about the role of forgiveness in her life.